The E-Commerce Class on Facebook Marketing saw an overwhelming turnout of over 150 attendees, all keen on picking up any tips they could about marketing on Facebook from three internet marketing gurus, who were there to share their wisdom on Oct 18. The first speaker was Jason Gan, the CEO of TribeUp, a Penang-based Web and Digital Agency. Gan gave a brief introduction to Facebook marketing, then delved right into addressing the public’s most common concerns about Facebook marketing. Gan revealed that a majority of users were not aware of the Facebook marketing objectives, which are a set of 13 specific objectives that Facebook aims towards for that particular marketing campaign. Some of these objectives include raising the number of likes and getting a high number of shares on, say, a particular post. “A majority of Facebook ad users do not understand Facebook’s marketing objectives, and that leads to a misunderstanding that Facebook ads are not worth it. However, with proper knowledge of the objectives, and knowing how to take a series of actions that leads to the goal, Facebook marketers will be able to see their engagement on their Facebook ads increase,” said Gan. Gan shared about the concept of building a funnel utilising the 13 Facebook objectives, and leading users to take action towards what the merchant wants from their Facebook marketing campaign. “Do you want link clicks? Likes? Shares? Be sure to know your goal. That’s very important,” said Gan, who also reminded attendees that, ultimately the goal is to get the user to buy something from the merchant. A question was posed about whether this concept worked with a B2B model of business, considering Gan had used B2C examples throughout his session. Gan replied that, yes, the concept definitely worked for B2B, but that would require a different approach and execution, as a B2B merchant would be looking at a different target audience with different purchasing habits. The second session had Soh Yien Yee, the COO of Avana, as the speaker. Soh spoke about integrating selling on to Facebook as well, in addition to marketing. Avana stands as a potential solution to allowing merchants to sell online through Facebook. “A major problem in SEA is that micro sellers have a fragmented online selling process with no integrated system to manage all their business processes. This leads to a lot of issues with inventory, among others, and can lead to overselling or underselling due to the lack of inventory control. Avana helps to handle those issues, and even helps merchants to answer private messages to retain customers through the process of Facebook shopping,” stated Soh. Soh also mentioned the importance of understanding the demographics that a merchant was targeting, stating that “there is no such thing as a product that targets everybody”. “When marketing, one approach is to use the foot-in-the-door approach. Use ‘like’ marketing, copy writing, branding, and calls to action that target your specific demographic,” advised Soh. According to Soh, part of remarketing is maintaining omnipresence, and keeping lists of anyone who has ever liked the page or even shown remote interest, as those are leads that can be pursued, and potentially converted to sales. To aid in this, Avana offers merchants a multi-channel selling storefront, which allows customers to buy from Facebook, using a tablet, a phone, or on a computer. The storefront also comes with an integrated all-in-one dashboard for ease of control. 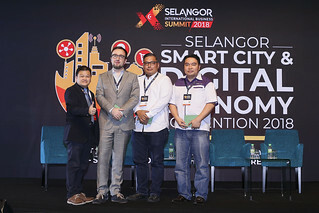 The service even includes a process that answers queries through Private Messaging to the merchant’s Facebook page, noting that this was part of Malaysian culture, and that merchants should not lose out on sales from there. Avana does not take transaction charges. The third speaker was Charles Gregory, the CEO and Co-Founder of Digital Marketing Consultancy, who spoke about crafting customer personas as part of knowing a target audience, as well as introducing several tools that would help in keeping tabs on the competition, as well as updating the aforementioned customer personas through knowledge of what is trending among a merchant’s target audience. “The modern marketer needs to play multiple roles, who has to be an artist and a scientist at the same time. A very important component of Facebook ads is a scroll/thumb stopper, but these have to be tuned to customer personas, which can only be crafted if the merchant knows very well who the target audience is made up of,” said Gregory. After talking about examples of customer personas, such as a university student, Gregory noted that birds of a feather flock together, which would make it easier for those using customer personas to target a specific audience. Some of the tools that Gregory brought up include Audience Drill and Facebook Ads Spy, both of which he noted help to identify customer personas, and serve the additional purpose of knowing which ads in a campaign are working. “If you find something that works, even if it is from a competitor, emulate it, and find a version of it that works for you. Fine-tuning it to suit your needs is definitely part of the process,” noted Gregory, who shared about Vspy.co as a tool that helps marketers find ads that target similar target markets, or uses similar key words, and allows the marketer to find ads to emulate. One more tool that was shared by Gregory was Buzzsumo, which shows trending topics that utilise the keywords input into a search engine. This, he noted, would aid in crafting customer personas as well. 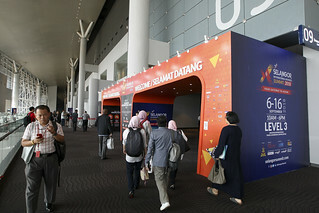 After the three speakers had concluded their sessions, two representatives stepped up during the merchant sharing session to speak about their offerings. The first was Mabel from cacaFly, which provides services for cross-media and cross-device advertising. According to the digital marketing consultant, the company optimises performance by leveraging on big data analytics, and will customise marketing strategies for clients by following industry trends. The company also includes options such as 360 ads for its campaigns. The next merchant was Chris Yan, the trainer for the eUsahawan program sponsored by MDEC. 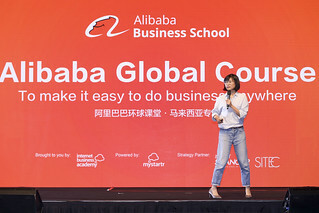 The program is a basic course that helps merchants to understand the ecosystem of internet marketing, and Yan shared testimonies of success from course alumni.